No, she's not brown! Coal-Amity (pronounced like "Calamity") is bay black, and a beautiful uniform color with consistent locking and fineness from her topknot to her toes, and what coverage! She has fuzzy ears and thick fiber inside her legs. Coal-Amity has heavy bone one a compact well-proportioned frame. We lover her fleece and impeccable conformation and so do the judges! 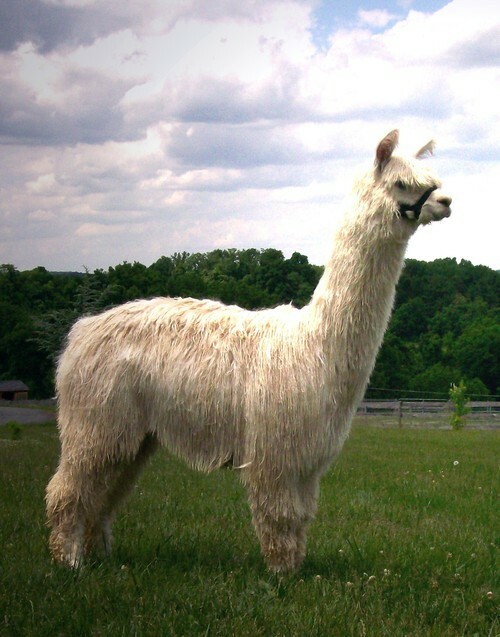 She has several Championships in Halter and Fleece at Level V shows. 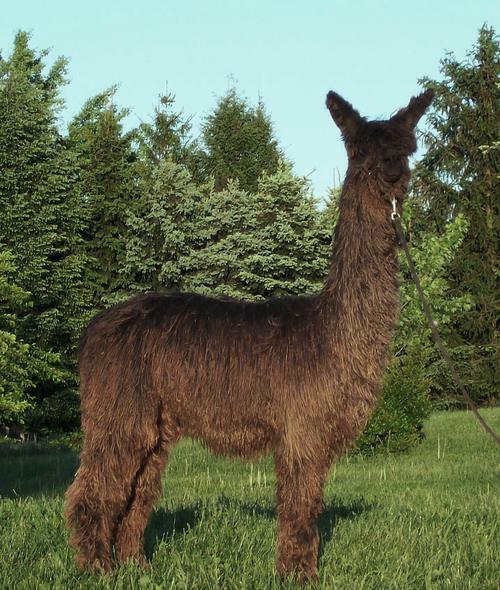 Coal-Amity was Reserve Champion at the 2011 Buckeye Halter Show in her 2nd fleece, growing a 7" annual length and maintaining supreme fineness in the re-growth. 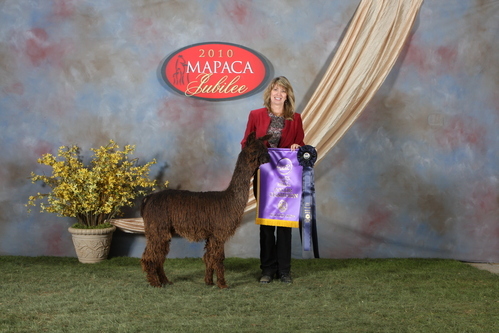 She was also the 2010 MAPACA Jubilee Black Color Champion as a juvenile at the largest alpaca show in the country, and then her fleece won at the Black Color Champion at the 2011 MAPACA Jubilee Fleece Show! Coal-Amity's dam, Fox Run's Peruvian Sakari, is one of our foundation dams and daughter of Accoyo Kotzebue. Sakari has very fine white fiber and black skin. 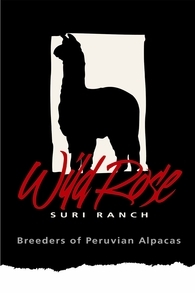 Her 1st cria is WRSR Accoyo Allegiance's Avanti, MAPACA 2-time Color Champion and 2010 Judge's Choice winner. Coal-Amity's sire is multiple-time champion Allegheny's Peruvian King Coal (2010 MAPACA Herd Sire of the Year), a beautiful True Black that produces Champion blacks and other dark colors from white dames, along with amazing fineness, lock architecture, and luster. While she is currently a foundation dam, she is offered for sale as we reduce our herd to lower numbers. Arrange a visit to see this beautiful female and the winning offspring she produces. 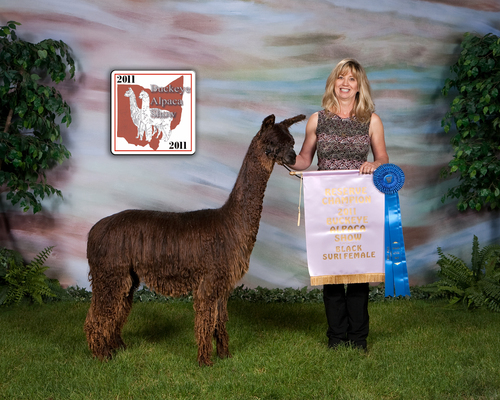 Her 2014 cria is WRSR Coalypso by Hotazel, who won 1st Place at the 2015 MAPACA Jubilee Halter Show, pictured below. 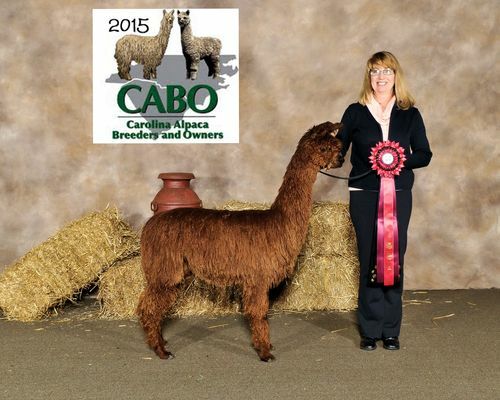 She also was awarded 2nd Place at the Carolina Alpaca Show. Coal-Amity was bred to our multi-champion male, WRSR Serengeti by Razor, and delivered a beautiful appaloosa female cria on 8/12/17. She was up and running within an hour, and her color is beige with dark fawn spots. Every day we see more spots popping out! Coal-Amity is sold rebred, and is available after the cria is weaned at 4 months of age. Contact Patti by email or call 443-740-4240 for more information.